Sarah Rogers Morris is a doctoral student in the Department of Art History and a recipient of the University of Illinois at Chicago University Fellowship. She studies modern architecture and design with a special focus on architectural photography and the social and cultural history of Chicago’s built environment. Her research on Hedrich-Blessing, a commercial photography studio, considers photography’s role in constructing and promoting ideas about Chicago as a center of architectural innovation in the twentieth century. Sarah holds an MA in the history of design, decorative arts, and material culture from the Bard Graduate Center and a BA in art history from New York University. Her writing has been featured in a variety of scholarly and popular web and print publications, including Architect's Newspaper and Pin-Up. Sarah’s Master’s thesis, “Richard Nickel’s Photography: Preserving Ornament in Architecture,” was published in the peer-reviewed journal Future Anterior by the University of Minnesota Press in 2013. 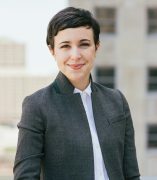 Sarah has worked in the non-profit sector for over a decade, including at the Graham Foundation for Advanced Studies in the Fine Arts, Frank Lloyd Wright Trust, MoMA, Judd Foundation, Mies van der Rohe Society, and most recently, as Executive Director of the Chicago Women in Architecture Foundation.